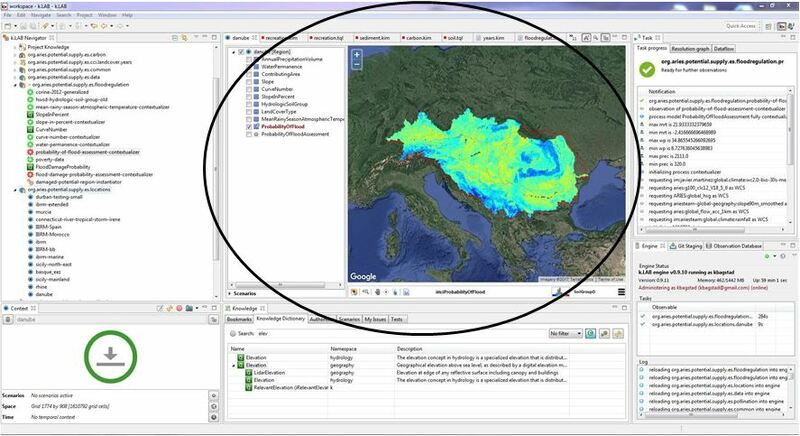 The IM development team develops and maintains the knowledge lab (k.LAB) software stack to support integrated modelling. 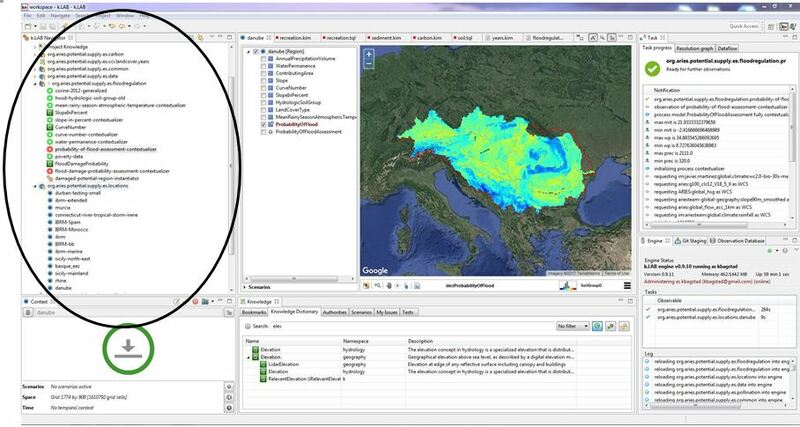 k.LAB provides two server applications (k.Modeler for modeling and k.Server for knowledge management and distribution) and a modeler’s integrated development environment (IDE). The IDE works as a client for k.Modeler and can be used to develop, manage and run model projects.k.LAB is an open-source software project running in an Eclipse-based IDE, which can be downloaded and accessed by potential users. The k.LAB navigator window shows active projects and namespaces containing knowledge the user has developed or accessed through Bitbucket. Dragging and dropping a context, then a concept, onto the context window starts the process of model resolution. 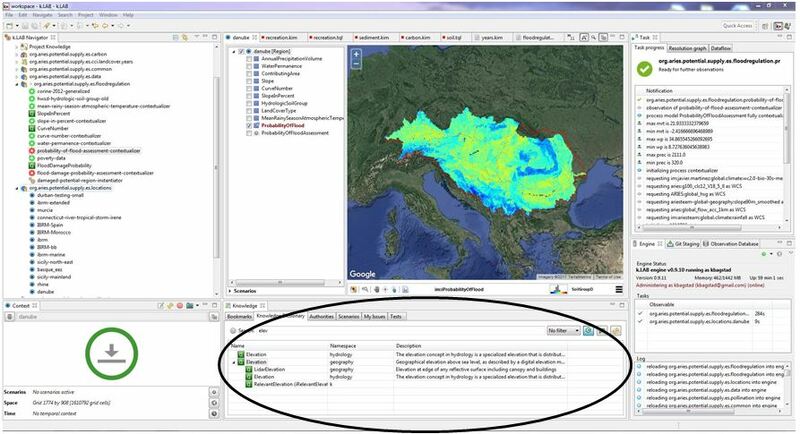 The context window allows the user to set the spatiotemporal context of interest and to run scenarios. The main window can be used for coding and the display, interpretation, and export of the modeling session’s results. The knowledge window allows the user to browse existing concepts, contexts, scenarios, and authorities. Dragging and dropping a context, then a concept, onto the context window starts the process of model resolution. The task window shows the status of model runs in progress. 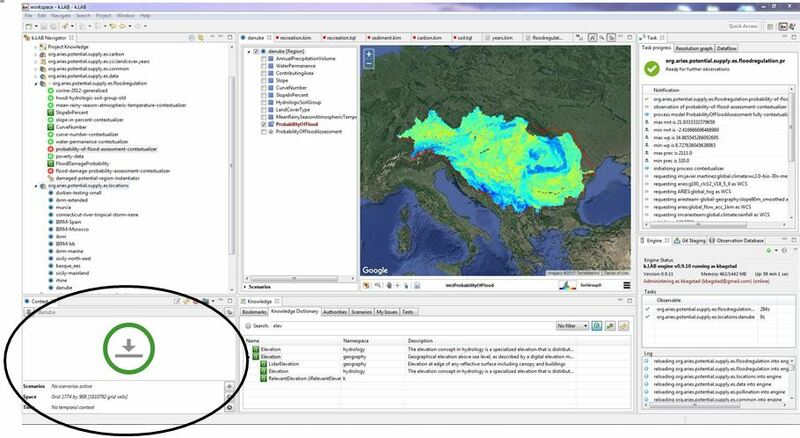 When model runs are complete, provenance information can be viewed. The engine window can shows the status of your machine’s server and individual user certificate. It also includes tabs showing commit status using Git, and an observation database allowing users to define new contexts.